I'm no Pavarotti, but recording the vocal track is often my favorite part. With a decent microphone, vox are where I feel like my tracks really shine. If you live alone—or with very patient folk—you can get this far in your GarageBand project just by relying on your iPad's speaker. When it comes time to record your vocals, however, headphones are a necessity. That's because you don't want your microphone to pick up the tinny sounds of your iPad speaker playing back the backing tracks along with your voice. 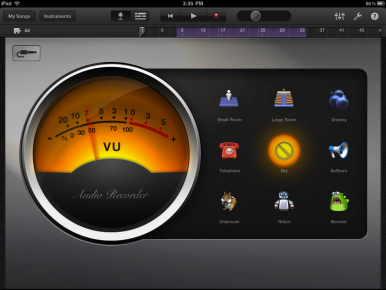 GarageBand's vocal effects are lacking, unless your goal is to sound very heavily stylized. During recording, you can monitor your levels with the skeuomorphic VU meter; my goal for myself is to keep out of the red. After I've recorded my first pass, GarageBand unveils a suite of effects that I can apply to my sonorous baritone: Small Room and Large Room (which add various degrees of faux-room tone), Telephone and Bullhorn (which play with compression and equalizer settings), Chipmunk, Robot, and Monster (which are essentially Photo Booth for audio), and Dreamy (for adding weird muffling layers and an echoing chorus effect). I don't use any of them for this song—unfortunately, all of the effects sound fairly gimmicky with limited utility. (I'd love a manual EQ editor, but I suppose Apple had to hold back something for GarageBand 2.0.) On the plus side, the app does offer basic echo and reverb control outside of these filters for each track; I just tap the Levels icon with my vocal track selected, and then use the Reverb and Echo sliders. "The Barnyard Dance" doesn't need an echo, but a little smidgen of reverb on the vocal track to keep things from sounding too dry suits me just fine. While it's true that part of the appeal of GarageBand on the iPad is its extreme portability, you'll want to do as much as you can to maximize your sound quality—just as you would with more professional recording software. That means using the highest-quality microphone you can, and using a pop filter to protect from those plosive p's and other such sounds. And, of course, you'll want to make sure you're recording in a quiet room where mewing cats, honking cars, and giggling children can't sneak their way into your masterpiece. Most importantly, you really want to make sure you don't clip your audio by getting too loud; flaws in the background music are far easier to mask than distortion in your lead vocal. Also important: Don't bleed! If your headphones leak any audio—particularly metronome clicks that shouldn't be in the final recording—that can cause all kinds of problems. When I'm recording vocals, I tend to lower the levels of less-important music tracks, or even mute them, if possible. And if I feel like I no longer need the metronome guide, I tap the Wrench icon (for song-wide settings) and slide the Metronome switch to Off. If you're going to add harmony tracks, chances are you'll want the same effects (including echo or reverb levels) as your first vocal recording. To duplicate your main audio track (or any other track), go to the timeline and tap once on the desired track's icon to select it—in this case, the microphone. Tap a second time to bring up a pop-up menu with a Duplicate option. 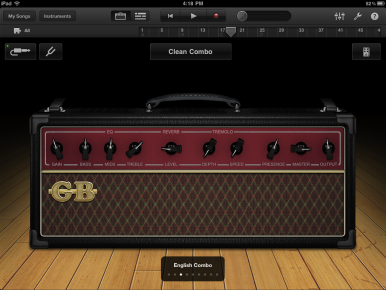 For some more fun vocal manipulations, you can turn to the Guitar Amp instrument. GarageBand's built-in vocal effects are—admittedly—a bit lacking, but the app still packs in a slew of awesome manipulations if you know where to look. By playing with GarageBand’s Guitar Amp instrument and its presets—and there are many, along with oodles of stompboxes—you can wreak havoc with your vox; sometimes, even in a good way. Just choose one, and if no guitar is plugged in, GarageBand will listen to (and stylize) your voice through the microphone instead. For "The Barnyard Dance," I wanted to add in a little imitation-guitar using my voice. Using Guitar Amp’s Old School Funk amp with some Fuzz and some Auto Funk boxes, I managed to make my voice resemble a half-decent lead guitar line. And recording it, unsurprisingly, was a heck of a lot of fun. I’ve added my lead vocals and a vocal guitar track to boot. With those nailed down, it's time to put everything together. The fourth step in Lex Friedman's create-a-song-on-the-iPad project: adding the vocals.